We were recently delighted to win a contract with the Scottish Salmon Company, a fully integrated salmon farming business, and one of the latest clients to take advantage of our contract moulding services. Though the business is far from local to our North-West premises – with their head offices as far away as North Uist in the Outer Hebrides – they chose Excelsior Roto ahead of three competitors, and contacted us with an order in two parts. The first was to create two sheet steel tools (which were manufactured at our sister tooling company Crossfield Excalibur). 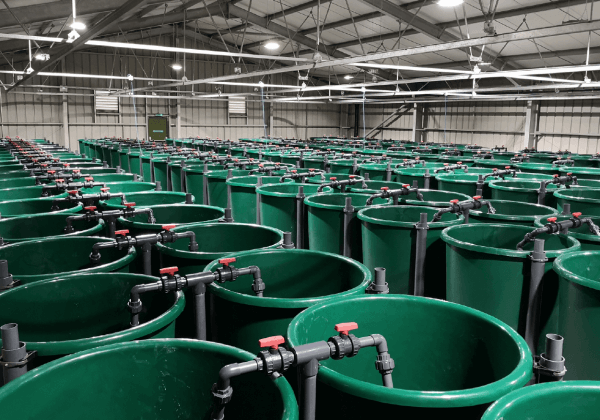 The second part of the order involved manufacturing hundreds of fish bins and bases for their purpose-built salmon family breeding unit. These fish bins and bases are vital to the Scottish Salmon Company’s day-to-day operations. The business breeds several salmon families each year, each one comprising one female and a number of juveniles. Each family is contained in a single tank, and remains isolated from other families until every member has been individually tagged. Then, the families are moved to bigger tanks and mixed together, allowing staff to identify families and individual salmon by reading their electronic tag. You can explore some more of our recent successful case studies here, or if you have a project in mind, don’t hesitate to contact Giles on 0161 765 2013 or email giles@excelsior-ltd.co.uk. "Excelsior were exceptionally quick to reply throughout the initial correspondence, and extremely helpful from then onwards. The end product is exactly as we envisaged, and it’s perfect for our purposes."